In Human Time, the first exhibition of the Climate Museum, explores intersections of polar ice, humanity, and time through video and photography installations by artists Zaria Forman and Peggy Weil. It also includes a timeline with artifacts relating the physical history of the Arctic to its significant influence on both culture and science. Every week, climate news confirms that the poles of the Earth which seem implacably vast and frozen, unchangeable and forbidding are in fact, far from invulnerable. Polar ice is disappearing on a scale our minds cannot comprehend. Indeed, it is one the clearest and strongest demonstrable summaries of the massive changes caused by human action. In Human Time asks how this contradiction between invulnerability and fragility reflect on us. If on the one hand, our capacity for awe, creativity, curiosity, knowledge and understanding, communication and common action offers optimism for our surviving the climate crisis, our capacity for heedless destruction does not. Our agency—in decision and action—is caught in the tension of our conflicting capacities. Meaningful shared action demands a stronger awareness of time, of its continuum and urgency, in ways that are often less comfortable or natural to hold. 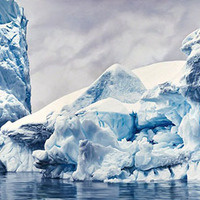 Both Weil and Forman raise these issues at planetary scale: Weil traces planetary temperatures preserved in cores of ancient ice while Forman foregrounds the enduring beauty of landscapes undergoing relentless change. James Baldwin said of the struggle for racial equality and our common humanity that "[t]here is never a time in the future in which we will work out our salvation. The challenge is in the moment; the time is always now." Human beings will be living with climate change past the foreseeable horizon. What that looks like will depend on decisions we make together about our thought, dialogue, and action—now. Friday, January 26, 2018, 6:30-8:30 p.m.
Christiane Paul, Oliver Kellhammer, and Peggy Weil will discuss art and climate change in the context of Weil’s film 88 Cores, on view for the first time as the centerpiece of In Human Time. How can we comprehend the inhuman scales at work in global climate change? The conversation will explore how art and digital media can enhance our understanding of time and space in the context of the environment. For more information please visit the In Human Time site.